The highlights of the sermon. The Anointing is the enabling of the Holy Spirit that imparts God’s divinity and power. A slice of his divinity is imparted to you. It’s the tangible presence of Holy Spirit. It gives us the ability to perform supernatural feats. The wine in the scripture above represents the Anointing of Holy Spirit, Milk represents Word of God. The difference between a Christian who’s anointed and a Christian who’s not Anointed is like one driving a car and other pushing a car. Luke 4:14 Then Jesus returned in the power of the Spirit to Galilee, and news of Him went out through all the surrounding region. The Anointing gives you identity. People knew Jesus as the son of the carpenter in the first 30 years of His life. The moment the Anointing came upon Jesus, God the Father made Him known to the entire world. When the Anointing comes upon you, you’re like a city set on a hill that cannot be hidden (Matthew 5:14). The Anointing will never go unannounced. It’s the Anointing that distinguishes one Christian from another. He gave the example of Aimee Semple McPherson (1890 to 1944) who was woman preacher in the US, in the days, when women were not allowed to vote in US. What happens when the Anointing comes? 1. The Anointing ensures leadership. 1 Samuel 10: 1,2 Then Samuel took a flask of oil and poured it on his head, and kissed him and said: “Is it not because the Lord has anointed you commander over His inheritance? [a] 2 When you have departed from me today, you will find two men by Rachel’s tomb in the territory of Benjamin at Zelzah; and they will say to you, ‘The donkeys which you went to look for have been found. And now your father has ceased caring about the donkeys and is worrying about you, saying, “What shall I do about my son? 2. The Anointing recovers possession. 3. The Anointing compels progress. 1 Samuel 10: 3 Then you shall go on forward from there and come to the terebinth tree of Tabor. There three men going up to God at Bethel will meet you, one carrying three young goats, another carrying three loaves of bread, and another carrying a skin of wine. When God moves, all your stagnation will come to an end. The Anointing stops stagnation and pushes you forward. 4. The Anointing restores dignity. 1 Samuel 10:4 And they will greet you and give you two loaves of bread, which you shall receive from their hands. God’s anointing will supernaturally restore your dignity. 5. The Anointing attracts favor. 6. The Anointing imparts divinity. 1 Samuel 10: 6 Then the Spirit of the Lord will come upon you, and you will prophesy with them and be turned into another man. A slice of God’s divinity is deposited unto you. You are a spiritual being living in human flesh. 7. The Anointing makes you a sign & wonder. 1 Samuel 10: 7 And let it be, when these signs come to you, that you do as the occasion demands; for God is with you. John 14: 16-17 And I will pray the Father, and He will give you another Helper, that He may abide with you forever— 17 the Spirit of truth, whom the world cannot receive, because it neither sees Him nor knows Him; but you know Him, for He dwells with you and will be in you. 1 John 2: 27 But the anointing which you have received from Him abides in you, and you do not need that anyone teach you; but as the same anointing teaches you concerning all things, and is true, and is not a lie, and just as it has taught you, you will[a] abide in Him. The Anointing is very very valuable. Without it, it’s like a car without fuel. The Anointing is not free. The price is to come, set aside your busyness and come to the Father. Come to Him in person. Every encounter is individual, said Pastor Kong. After the message, he invited business owners and spouses to come forward. He laid hands on every individual and anointed them with oil. The Power of God was awesome at the place. Praise God for the wonderful time ! 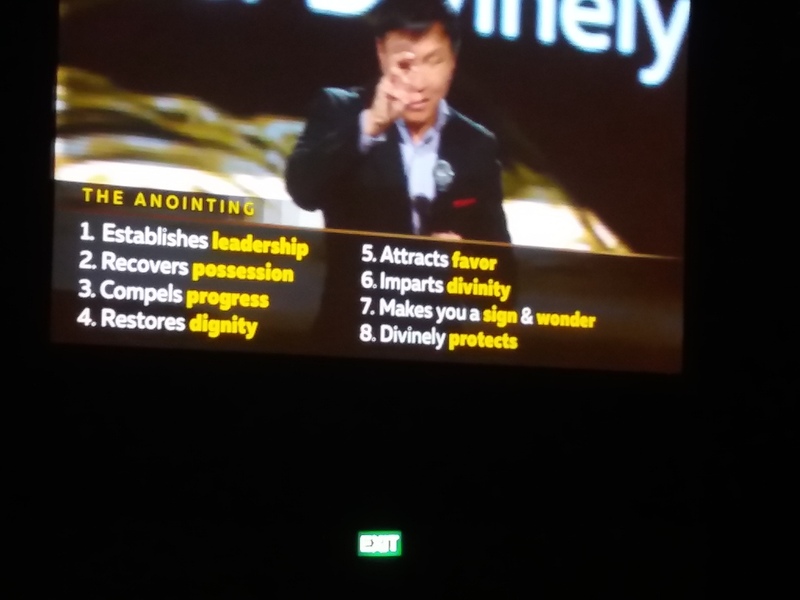 This entry was posted in City Harvest Church. Bookmark the permalink.